Semi-detached villas with unobstructed sea views along Penang's famous tourism belt Batu Ferringhi are poised to be one of Ivory Properties Group Bhd's latest offerings this year. The project which carries a gross development value of RM27 million will comprise only 11 units of the resort-style development which is located within a hillside setting with an ocean view. The company's deputy chairman and executive director Datuk Seri Nazir Ariff Mushir Ariff said Ivory Properties will also unveil this year a luxury condominiums project known as "The Latitude" in Tanjung Tokong, Penang. "The Island Resort semi-detached villas will be launched by the middle of the year and we expect to complete the project by 2014," he told Business Times. Also present at the interview was the company's head of investor relations Ang Kung San. Nazir said each of the four-storey villas, comprising four plus one bedrooms and 5 bathrooms, will boast its own lift and private plunge pool. Tagged between RM2.33 million and RM3.98 million, the 11 units are part of Ivory's "10 Island Resort" project, which is sited at Batu Ferringhi's Miami Beach. The villas come in various sizes, with built-up areas ranging from 3,820 sq ft to 6,450 sq ft.
Nazir said the villas, along with the 220 units of the upscale "`The Latitude" (which is sprawled on a 0.82ha and carries a development value of RM137 million) are among the 300 units of property which Ivory Properties will be lining up for sale this year. The company currently has an undeveloped landbank of between 160ha and 200ha in both Penang and Tanjung Malim, Selangor. 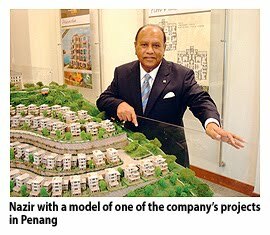 "We are actively looking for land and joint-venture partners in Penang and the Klang Valley," Nazir said. "We intend to construct and sell the proposed hotel and are seeking for investors to co-build the hotel with us." He also said that work on Phase 3 of Penang Times Square, which will comprise luxury condominiums, a convention centre, cineplex and a 150,000 sq ft departmental store, is expected to take off by the end of this year. 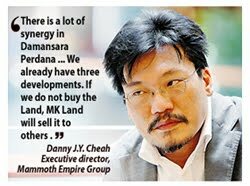 The Mammoth Empire Group was the recent buyer of two pieces of land in Damansara Perdana, Selangor, from MK Land Holdings Bhd. It is learnt that Datuk Sean Y.T. Ng, founder of the Empire Group, had made the offer via Foster Estate Sdn Bhd. This is the fourth piece of land the Empire Group is buying from MK Land. MK Land announced on January 4 that Foster Estate plans to buy two pieces of land in Damansara Perdana, comprising 7.4ha and 3.3ha for RM100.8 million and RM29.2 million respectively. According to Mammoth Empire group executive director Danny J.Y.Cheah, Foster Estate aims to set up an integrated property development, comprising commercial and residential towers, and retail. "There is a lot of synergy in Damansara Perdana. We already have three developments. If we do not buy it, MK Land would sell it to other developers. "There is a lot of economies of scale for us to do another project in Damansara Perdana," Cheah told Business Times. The group's current projects in Damansara Perdana includes Empire City, an integrated lifestyle commercial development on a 9.2ha site; Empire Damansara, a mixed development; and Empire Residence. Empire Residence, a high-end gated and guarded development on 19.2ha of land, is a joint venture with MK Land. KUCHING: Ibraco Bhd, which is expected to come out of the Practice Note 17 (PN17) status soon, has chalked up sales of RM140mil for its newly-launched commercial, industrial and residential project called Tabuan Tranquility. Located along the Kuching-Kota Samarahan Expressway, it is Ibraco's biggest mixed development project on 66ha which comprises 640 double-storey terraced houses,108 semi-detached houses, 60 three-storey townhouses, 76 units of four-storey shophouses, 72 semi-detached industrial buildings, an office block and a petrol station. Also on sale are 24 residential detached lots. Chiew Chiaw Han says Ibraco is on the lookout to increase its landbank. Ibraco chief executive officer Chew Chiaw Han said the project, which formed part of the company's regularisation scheme, had a gross development value (GDV) of RM517mil. “The project has a five-phase development up to 2015. Two of the phases have been launched,” he told StarBiz yesterday. The project is expected to generate a gross profit of RM83.5mil. He said 70 units of the shophouses priced between RM1mil and RM1.79mil had been sold for RM73mil. The mall will be completed in July. Sales of RM67mil were generated from 160 houses under phase five launched more than a month ago. This phase comprises 204 terraced houses and 38 semi-detached houses priced between RM363,000 and RM800,000. They are expected to be ready by November next year. Chew said Ibraco would maintain property development as its core business, adding that there was no plan to diversify into other businesses. The company has a landbank of about 285ha in Sarawak more than 50% of which is in Kuching. “We are on the lookout to increase our landbank,” he added. Last week, the company announced its proposal to sell a piece of land in Kuching for about RM14.2mil. Chew said the proceeds would be used for its working capital. He said Ibraco, which completed its regularisation scheme a week ago, was expected to exit the PN17 category in the second half of this year. After the completion of the regularisation, the company is required to report profits for two consecutive quarters. Chew said Ibraco, which has a paid-up capital of nearly RM99.5mil, settled all its bank borrowings of RM12mil last week, and had zero gearing now. The company's single-largest shareholder is Sharifah Deborah Sophia Ibrahim, with a 21.7% stake. Sharifah Deborah is the daughter of Ibraco founder, the late Wan Alwi Ibrahim whose family once owned more than 60% of the company. The other substantial shareholders are newly-appointed executive director Datuk Wee Song Ching (16.79%), Singaporean Ng Cheng Chuan (16.61%) and Chew (11.51%) through his firm Hiap Ghee Seng Sdn Bhd and a direct stake. BEIJING: Beijing authorities plan to build a "seven-star hotel" modelled after Dubai's Burj Khalifa - the world's tallest building - in a US$1.3 billion (US$1 = RM3.07) joint project with Saudi Arabia. The hotel will be erected in western Beijing's Mentougou district some 30 kilometres from the Chinese capital's centre, the state-run Beijing Morning Post said in a Thursday report, quoting a local parliamentary meeting. A district official, who declined to give his name, confirmed the project and its price tag in comments on Friday. He said that the Saudi side was expected to foot the entire bill but he refused to provide other details, such as why such an expensive project would be located in the underdeveloped rural area. The Beijing Morning Post said the building's design would be patterned after the 828-metre Burj Khalifa's distinctive slender, tapering design, but did not say how tall the planned structure would be. The "seven-star" classification is not officially recognised internationally, as no formal body awards ratings above five stars, but there are a handful of luxury hotels around the world that still use the distinction. Dubai's Burj Al Arab is one such establishment, and in Beijing, the Pangu 7 Star Hotel built near the 2008 Olympic stadium also claims the rating.